Freedom, today perceived simply as a human right, was a continually contested idea in the early modern period. 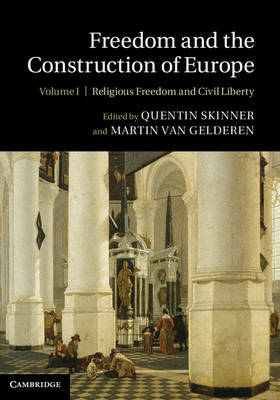 In Freedom and the Construction of Europe an international group of scholars explore the richness, diversity and complexity of thinking about freedom in the shaping of modernity. Volume 1 examines debates about religious and constitutional liberties, as well as exploring the tensions between free will and divine omnipotence across a continent of proliferating religious denominations. Volume 2 considers free persons and free states, examining differing views about freedom of thought and action and their relations to conceptions of citizenship. Debates about freedom have been fundamental to the construction of modern Europe, but represent a part of our intellectual heritage that is rarely examined in depth. These volumes provide materials for thinking in fresh ways not merely about the concept of freedom, but how it has come to be understood in our own time.